“You know,” said the geneticist, “it’s really hard to predict what you can expect, what with all the therapies they have developed, things have changed so much in the last twenty years for children with Down’s.” That sentence stuck in my head even while the first few weeks of Lyra’s life found us submerged by what having a child with Down syndrome can mean, including finding resources to help us learn what we could about our daughter’s condition and, of course, dealing with her cataracts and eye surgeries. All the while, the geneticist’s words whispered repeatedly in my mind, with all the therapies they have developed. The remarkable increase in life expectancy in recent decades was one of the first facts we learned about Down syndrome and it highlights the dramatic improvement in the research, care, and therefore, quality of life for a person born with Ds today. In 1985, shortly after Max and I graduated from high school, the life expectancy for a person born with Ds was just 25. Today it is 60 and that number is expected to continue increasing as modern medical research also continues to advance the understanding and amelioration of Ds. Not only are people with Ds living longer, they are living vastly different lives than they would have half a century ago. In fact, as the National Down Syndrome Congress has shown with their “More Alike Than Different” campaign, today most people with Ds can expect to lead rather, well, “typical” lives. Until the 1960s, most children born with Down syndrome were institutionalized. When I was growing up, it was rare to see someone with Ds. I never had a classmate with Ds nor do I recall any special classrooms for children with Ds in any of the schools I attended. And I am not aware of any families who had children with Ds, which doesn’t mean that they didn’t exist, but those that did were perhaps institutionalized and not discussed. It was not until the 1970s that the two major U.S. organizations that advocate for people with Down syndrome, the National Down Syndrome Congress (1973) and the National Down Syndrome Society (1979), were created. Both organizations make clear that caregivers—parents, teachers, friends and extended family—should set the bar high for kids with Ds. Children with Ds most often meet and regularly exceed the goals set before them. The myths on what people with Ds are like and capable of have been falling like scales from our eyes and today there is every reason to expect a baby born with Ds to have a full and productive life, including mainstream schooling, college, independent living, careers, even marriage and (what surprised me the most) driving automobiles. All of which indicates that as a society, we were operating on grossly false assumptions for many decades, tragically so for children born with Ds prior to the 1970s. In the mid-1980s, my father and stepmother worked in a group home for adults with developmental disabilities, including some with Down syndrome. Across the nation, long-standing institutions that had housed people with developmental and physical disabilities were closing and group homes were opening to meet the need to care for many of these people. My parents worked in a freshly constructed ranch-style home, built to house eight residents. In the center of the ADA accessible house was a kitchen and living room, and on both sides of these common areas were four bedrooms, one for each resident. I was eighteen in the spring of 1984 when I took a Greyhound bus from Tucson, where I was living with my grandma, to Northern Michigan. I had not visited my family since leaving two summers earlier. When my father picked me up at the bus station in Traverse City, the hour long ride to the house was awkwardly filled with fits and starts of conversation. We had not yet talked about why, after living with him and his family my junior year of high school, I had decided to return to Ohio and live with my mother for my senior year. And we never did. Instead, we talked about my half-sisters and other people we both knew. Eventually my dad began telling me about the job working at the group home and we both relaxed. My dad felt like he had finally found his career calling and with his eyes cast on the road ahead of us, he effortlessly described his work, the words pouring like water from a full pitcher. The day after I arrived, my dad took me to the group home to meet the people he worked with. Many of the residents were in wheelchairs and most were overweight. When my father talked with the residents, introducing me to each of them, I could not understand what they were saying. I tried to be friendly, but the truth was, I couldn’t wait to leave. I didn’t see people, I saw drool and adult diapers. “How do you work with those people every day?” I asked my dad when he got home, “Isn’t it depressing?” Which was a fair question. Depression was like a card my dad carried to excuse himself for his significant inactions, especially as they related to those of us who, from time to time, would reasonably wish to lean on him. People like his wives and children. Then again, I ask myself, who among us has not risen to his or her better self with strangers while our seamier aspects are saved only for those who know us best? “But they aren’t like the people anywhere else,” I said. Let me stop and say that I am not upset with the younger me who, the first time I was introduced to severely disabled adults, recoiled. At the same time, my chest physically aches to think that anyone would feel similarly about my daughter when she is grown. My ignorance was ugly, but I did not remain ignorant. As with many things, education builds awareness, exposure builds understanding. My father worked at the group home until he moved to Arizona in the early 1990s, where he also worked with adults with developmental disabilities. Over the years, I came to feel I knew some of the people he worked with because of the stories he shared. Many had spent their entire lives in institutions, which was at the root of some of their more difficult behaviors. For instance, both my parents told me they worked to get the group home residents to eat their meals slowly and not scarf their food without swallowing. In the institutions, residents were fed in large cafeterias with little oversight and many had learned to eat as fast as possible in order to prevent anyone from stealing their food. Back then, eating at a table in the group home was often a resident’s first experience in family style dining with no threat of bullying. My dad became particularly close to one of his clients in Michigan. A quadriplegic, Jim found work typing out address labels (this was before computers were ubiquitous). My father jerry-rigged a helmet by affixing the writing end of a pencil above the center edge of the helmet’s brim. With the helmet strapped firmly under his chin, Jim’s head bobbed over an electric typewriter as he used the pencil’s eraser to type out names and addresses on sheets of labels. Jim used the money he earned typing labels to buy gifts for his girlfriend. She lived in a different group home and Jim saw her on weekdays at the adult day care facility they both went to. Like Jim, his girlfriend was in a wheelchair. But on more than one occasion, the two of them somehow managed to get their shoes and socks off and were found sitting away from any activity, their bare feet entangled. One evening when I was living in Boston, my dad called me from Arizona. In 1995, before cell phones found their way into everyone’s pockets, long distance calls were expensive and, thus, infrequent. Claude was a year old and I’d long gotten over my squeamishness of body fluids. Beyond diapers, I’d thought nothing of holding my baby as he repeatedly vomited on me a few days before his first birthday. Comforting my child trumped the sour smell of puke. Sure, he was a baby, my baby even. But nothing could have made me love him any less than I did including, as I discovered a few years later, a learning disability. “My friend Jim died,” said my dad when he called. It was the closest I’ve come to hearing my dad cry. Maybe he was crying. I didn’t ask. “Who’s Jim?” I asked instead and he reminded me of the resident in the Michigan group home. Once he’d moved to Arizona, my dad came home only a couple of times for important events like weddings. When he did, he always went over to the group home where he’d worked to visit Jim. My dad did not learn about Jim’s death until weeks after his funeral, but even if he had learned immediately, he would not have been to leave work and travel so far on short notice. Sitting in my kitchen in Boston, I listened to my father as he talked about his friend at length, a telephonic memorial service of two. 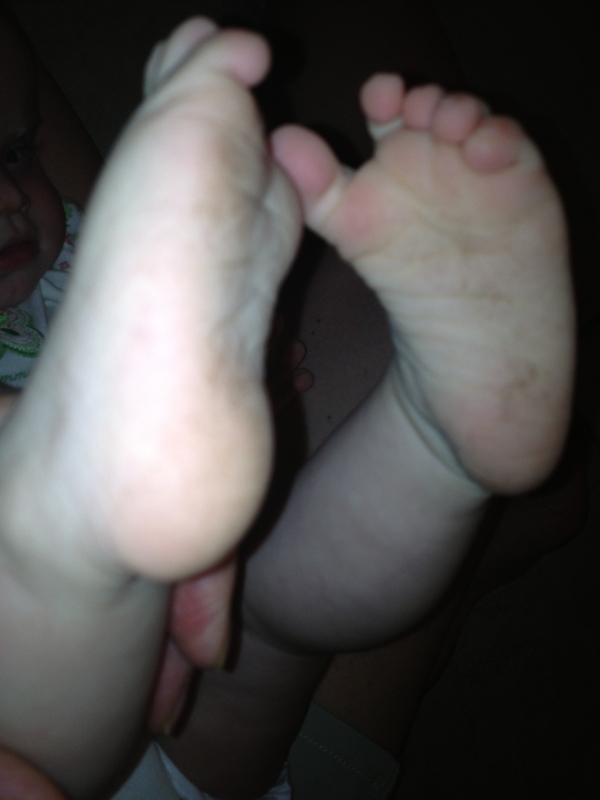 As expected, Lyra does have hypotonia, but I believe it is only mild to moderate. She does not spring with wirey muscles like my boys did when they were infants and babies, but neither was Lyra ever a “limp noodle” as so many babies with Ds are described. When she was four months old, I began taking Lyra to both speech and physical therapy at an office recommended by our pediatrician, Dr. M.
When my dyslexic sons, Claude and Jules, learned to read, we had to break down the cognitive understanding of sounds and symbols. With Jules, I had to spend months making up silly rhymes and alliterative phrases so that he could hear the similar sounds. Once letters and their sounds were memorized, all combinations had to be taught. And because the English language is comprised as much of exceptions as it is rules, countless “sight words,” or words that don’t follow the rules, had to be memorized too. So it is teaching Lyra to move her body through space—something I took entirely for granted with my four previous children. The first thing Lyra’s physical therapist, Heather, showed me was to pull Lyra up into a seated position by her wrists. Lifting Lyra slowly, her neck muscles engage and get a work out. By the time she was five months old, she was not only holding her head on her own but she keeping it upright as we bounced her on an exercise ball. Yes, the exercise ball is a big part of her PT, which for now has the overarching goal of getting Lyra to sit up and crawl. Lyra gets a better abdominal and arm work out each day than I do (though my muffin top and bat wings tell me I need to correct that). Little things feel like milestones. Things like Lyra jumping in her bouncy seat, her head held erect as she springs her body up and down, or rolling on the floor from her back to her tummy and over again onto her back, or purposefully reaching her hands and arms towards a toy she wants, or sitting upright in the middle of our laps where we can catch her when she lists. Lately, Lyra’s been bearing weight on her hands and arms when she is on her tummy, a sure sign that crawling is coming. We want Lyra to crawl, and crawl for a long time, not only so she can move herself to where she wants to go, but also because of the well-documented, kinesthetic brain development that crawling enhances. For two months, Lyra’s speech therapist helped us try to teach Lyra to take a bottle. When she was nearly six months old, we all gave up. This is the first of what I suspect will be a lifetime of wondering whether something about Lyra is simply her personality or her Down syndrome. With the bottle, I believe it is personality. She breast feeds like a champ, which requires more muscle strength than bottle feeding. However, the time spent with the speech therapist was not invaluable as we learned many mouth exercises that we continue to practice. These exercises, mostly mouth massage—both inside and out—have helped Lyra “organize” her mouth. As a result, her tongue thrusting has greatly reduced and she has had no trouble learning to eat solid foods from a spoon. Later this month, we will revisit the speech therapist to evaluate Lyra’s speech. But at nine months old she has long blown raspberries, babbles what sounds like the cadences of a distance conversation and then, as if providing commentary on the speech of those around her, will say, “Blah, blah, blah.” These are all very good signs for speech development. When I hold my baby girl, I do not see her Down syndrome, I see my daughter. We all adore her and love to make her laugh, but she is mostly like any other baby. Jules delights in walking his fingers up Lyra’s sides to her armpits to get her to belly laugh. 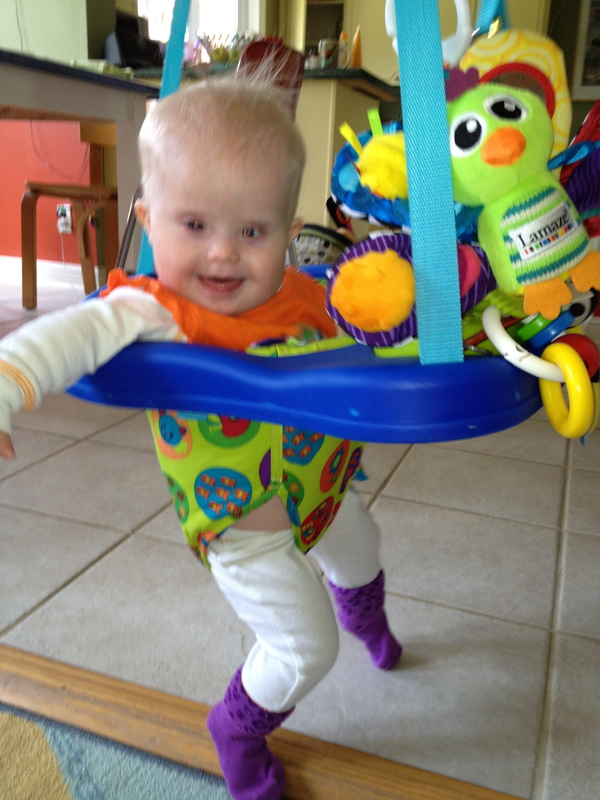 Leif holds Lyra’s hand and jumps with her as she hops up and down in her bouncy seat. All too often when they are playing on the floor, Lyra manages to grab a fistful of Leif’s long hair and pull it with all her might, causing her brother to scream in pain. The big boys send Max and me on dates, willingly keeping both of their younger siblings, caring for them with a naturalness that belies experience. But here is a true confession that makes me cringe: I am still a work in progress. I know in my head that when she is older I will see and love Lyra as I do now. Maybe she will be as accomplished and “mainstreamed” as the adults with Ds in the “More Alike Than Different” video. But maybe she won’t. I recently saw a lovely child with Ds, who was perhaps nine-years-old, happily engaging other people, especially little children. But when she spoke, I could not understand her and in that moment, and I felt the scabs peel off of my heart to reveal how attached I am to speech. I had to take Lyra to a corner of the room and nurse her while I quietly wept. I looked down on her dainty round head and, wondering if she’d ever speak clearly, I felt smacked by what is not alike, but different, about my child with Down syndrome. A few moments later, a young mother whose son is only weeks older than Lyra came and sat by me. She has a soft voice with a southern accent I cannot place, but which calmly drew me out of my sorrow. She told me her child could not keep food down because of reflux and he was chronically ill because, as they had recently discovered in a swallow study, he aspirates his liquids. A first time mom, this woman’s dedication to her child is both fierce and gentle. Knowing how overwhelmed I was with my firstborn, who had no physical challenges whatsoever, this woman’s tender acceptance of her child and his mighty challenges guided me back to my center and I stopped leaning into my fears of the unknowable future. We are a very verbal and literary family and we all enjoy talking, reading and writing. Two of us have made careers out of it and Claude may well too. My head tells me that Lyra will communicate effectively because she already does. She is not shy and her desire to interact with other people will propel her abilities to speak and/or sign (just as my own extroverted nature helped me learn French when I was a student in France). As her life unfolds, my heart will catch up with my head and I will continue to see my daughter as the person she is, not the extra chromosome she has. What gets me into trouble is forgetting to stay in the moment. This entry was posted in Lyra's Latests, Uncategorized and tagged Adults with Down syndrome, Alzheimer's in people with Down syndrome, Down syndrome, Group homes for people with developmental disorders, Physical therapy for children with Down syndrome, Speech therapy for children with Down syndrome. Bookmark the permalink. Dear Holly, This is such a wonderful post! It sends me back to the days when Claude and Hugo were babies. I wish I was closer and could meet Lyra in person. What a joy for you to finally have your beautiful daughter. The image of Jim entangling his bare feet with his girlfriend is so poignant. Also, I told my daughter the other night that I was a work in progress. She said, “Really?” I told her that I would always be and that was a relief to her. Great post Holly. I expected you’d understand it all. Loved this blog! Lyra is getting so big!! Just remember she’s your only baby girl first and everything else comes second! Keep working with her, therapy has been a game changer with Isaiah and I work everyday at home too and he’s doing stuff they said he wouldn’t do for years!!!! Love knows no boundaries and brings about miracles. Enjoy your miracle! I do, Colleen, I really do. Lyra’s the star of our show! Thank you, Helene! Your son’s blog is great!